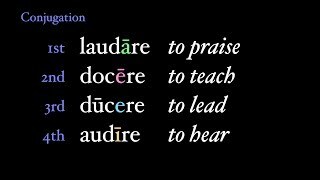 The infinitive in Latin comes in six different forms and four specific uses. This video covers not just how Latin utilizes the infinitive, the unconjugated form of the verb, but also how the infinitive changes in different tenses and voices. Infinitives are a very pure form of the verb, and Latin uses the infinitive in many different ways, and tenses and voices. 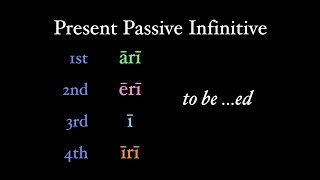 This video covers the present passive infinitive, the "to be ...ed" translation. I want this video to be watched and to be enjoyed! You see infinitives everywhere in Latin, from the second principal part of a verb's dictionary entry to sentences with possum and volo. 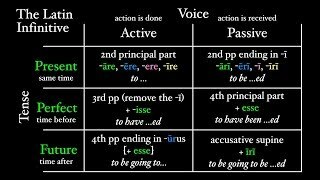 This video covers the basic of the present active infinitive (yes, that means there are other types of infinitives).